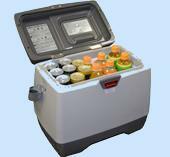 SW-Fuji portable Refrigerators with Freezer and Hot function is an efficient, portable and easy to get into vehicle refrigerator + Freezer + Hot. It will keep all food item or drinks ice-cold, or even frozen when plugged into your vehicle’s cigarette lighter socket. SW-Fuji refrigerator is lightweight, compact, and modern design to fit on the floor or anywhere of car. A convenient lid on the top of refrigerator makes it safe against the access of children to items inside the refrigerator +freezer + hot. The SW-Fuji portable freezer & cooler chilled your salad, wine, beer and drinks whatever your taste, and make your food and drink hot in winter season. Make outings and driving a pleasure with the SW-Fuji in your car. SW-Fuji is High technology and environmental compatibility and the most extensive portable refrigerator + freezer for the emergency medical treatment as well as carrying medicines, and vaccine etc. This is the first Japanese portable refrigerator and freezer that can produce ice in the car to enjoy maximum driving pleasure and outdoor activities. This 12V DC portable refrigerator + freezer with hot function run efficiently on either 12 volt DC or 100 volt AC power with optional AC converter sold separately. The SW-Fuji portable refrigerator is not only for comfort and luxury of your driving pleasure, but also ideal for the storage and transport of vaccines, medications and saline that require controlled refrigeration and constant temperatures. 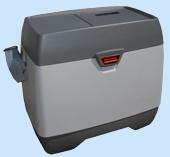 This portable refrigerator + freezer + hot can also be use at your home with AC power adaptor sold separately. The Refrigerator will be supply direct from Japan, and not by the car refrigerator Amazon, or car refrigerator ebay etc. Copyrights (C) Car Cool Box & Refrigerator Japan. All rights reserved.